The overarching objective of AtlantOS is to achieve a sustainable, efficient, and fit for-purpose Integrated Atlantic Ocean Observing System (IAOOS). AtlantOS contributes to blue growth by merging new information needs relevant to key sectors such as transport, tourism, fisheries, marine biotech, resource extraction and energy with existing requirements. In its Work Package 8 (Societal benefits from observing/information systems) AtlantOS will deliver a suite of products that are targeted at issues of societal concern in European Member States. These pilot actions are tangible outputs from the integration of Earth observation, in-situ data systems and model analyse, reanalysis and forecasts to form a usable product in five key GEOSS societal benefit areas. One demonstration will concern the application of SEAPODYM to the case of Atlantic albacore tuna population and fisheries with the development of an Operational forecast system for Atlantic albacore tuna. Why and how to monitor a key exploited tuna stock based on a fish and fishery model Integrating Ocean Observation? Fisheries regulations, as those established by the European Commission need to rely on the best available scientific advice to ensure that fish stock exploitation levels remain sustainable over the long term. Fish population dynamic models are essential tools used to estimate fishing impact and provide key indicators of exploitation. Progress in fish population modelling integrating environmental variables derived from Earth Observation and Operational Oceanography COPERNICUS CMEMS makes it possible to propose a demonstration of a near real-time forecast of one key tuna stock in the Atlantic Ocean. AtlantOS T8.7 will develop a demonstrator for the albacore tuna to simulate in near real-time the change in abundance over time and space of this species by life stages (larvae, juveniles, adults). A first necessary step is to rebuild the history of Atlantic Albacore tuna under the combined effects of fishing and environmental variability based on historical catch data collected by ICCAT and ocean variables available from satellite observation and ocean models. Then the results are transferred in an operational chain of production regularly updated with CMEMS products and show variability due to fishing and environment. This development follows the approach develop in the project INDESO for tropical tuna species. Two simulations will run in parallel with and without fishing impact. The difference gives the fishing impact on the stock while environmental variability is illustrated from unfished stock simulation. 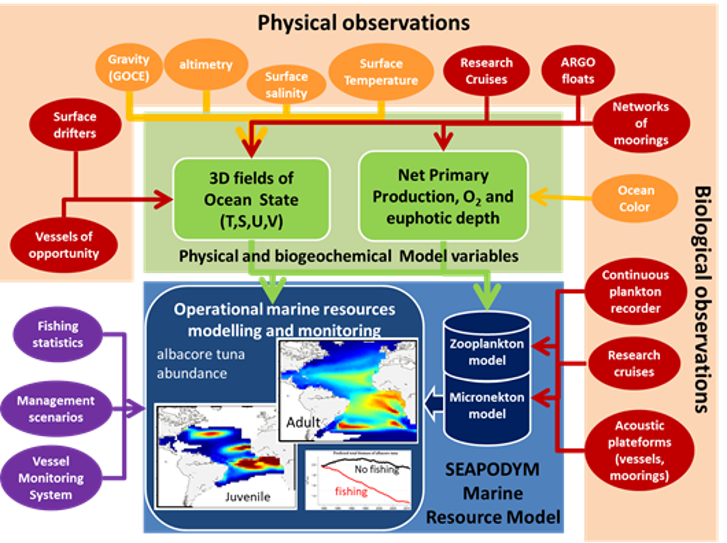 Albacore model outputs are aggregated by life stage and presented with density maps, and time series of key indicators are provided to a wide audience with explanatory text. GOOS Essential Ocean Variables (EOVs) are used to drive the albacore tuna model for the historical reconstruction and the weekly bulletin. They include primary production derived from satellite ocean colour and surface solar radiation, and ocean temperature and currents from operational models assimilating satellite (sea surface temperature, sea surface height) and in situ data (temperature, salinity and currents) provided by moorings and profilers. Other essential ocean variables are the dissolved oxygen concentration that is currently provided from a climatology (i.e. monthly average), and the zooplankton (prey of tuna larvae) and micronekton biomass (prey of juvenile and adult tuna) that are simulated from the same ocean variables. Finally, the fishing impact is included based on the fishing databases maintained by the International Commission for the conservation of Atlantic Tunas (ICCAT). SEAPODYM is used to simulate the change in abundance over time and space of Atlantic albacore by age class from larvae to oldest adults under the influence of environmental variable that drive the movement between feeding and spawning grounds, the success of spawning and the mortality of fish. The multiple international fisheries are described according to their characteristics (fishing gear, strategy, size selectivity, etc…) and their catch included to measure the fishing impact. As in the standard fish stock assessment modelling approach, a statistical method is used to calibrate the model parameters and thus provides estimates of fish abundance by age class based on observations (catch, fishing effort and size frequencies of catch). The simulations of albacore history will help to analyse the impact of current fishing levels, and the near real-time outputs should help management and monitoring decisions and the control of fisheries and detection of illegal fishing. They should also assist the fishing industry to plan their operations in order to maximise cost efficiency, decreasing fuel consumption and allowing profit at lower level of catch, thus providing favourable conditions to release fishing pressure on the exploited stock. Ocean in situ (red) and satellite (orange) data are the primary information to feed physical and biogeochemical models delivering the necessary variables for the Operational forecast system for Atlantic albacore tuna (T= temperature; S = Salinity; U and V are east-west and north-south components of currents).